It was the usual break-in time during the months that followed. Although the Little Dot T-100 didn't show up and I didn't feel like pursuing the Kallistos further, I was still lucky enough to secure a number of review loaner amps to test different combinations with the Sapphire and Topaz. 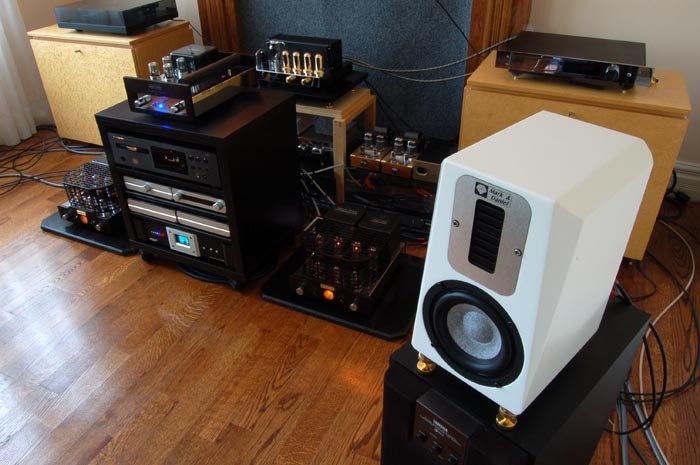 These new electronics included the Audio Space Pre-2 preamp and Nova M-34 monoblocks; the Dared MC-7P preamp; the NuForce Pre-9 and Reference 9 Version 2 monoblocks; and the Winsome Labs Mouse class-T amps. 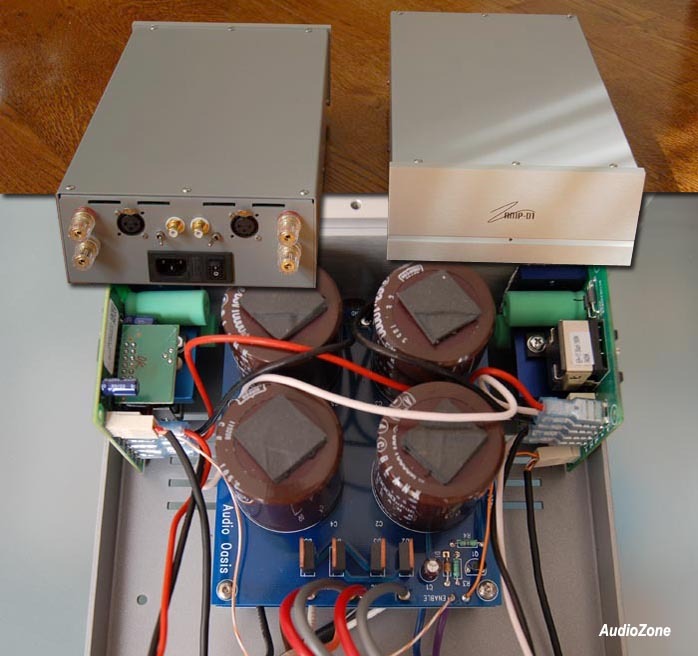 Towards the end of the audition, George Tordai of Audio Zone dropped off their latest addition to the class-D auditorium, the AMP-D1 stereo power amps. Naturally, these pieces fell into the Montague and Capulet rivaling families of amp design and a clichéd tube versus solid-state street fight was inevitable. As I had always been curious to find out how Mark & Daniel would sound with tubes, I lost no time hooking up the Audio Space system. I decided to focus on the Sapphire first, obviously the leader of this group. 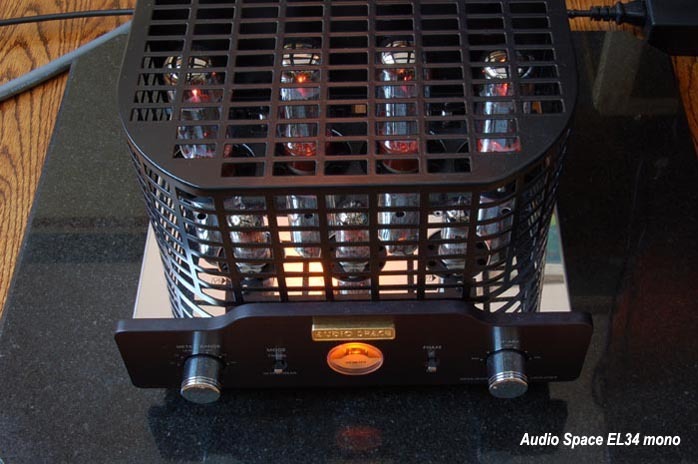 Tube compliment of the Audio Space Nova M-34 are the typical four EL-34s in push-pull, yielding 60wpc in ultra-linear mode and 32wpc in triode. That should do a good job, even with the 83.5dB sensitivity of the Sapphire. Things turned out better than good. The Audio Space unveiled a hidden beauty of Mark & Daniel I had never before been able to approach. Imagine the tight solid bass now coupled with an even more relaxed midrange and silky, airy highs with ample valve bloom. In fact, I found the bloom a bit excessive in ultra-linear. My personal preference was to set the Nova M-34 to triode mode, negative feedback dialed to max for better clarity. Nevertheless, Mark & Daniel's signature sound plus valve harmonics was a different musical experience worth savoring. Then I brought in the Dared. 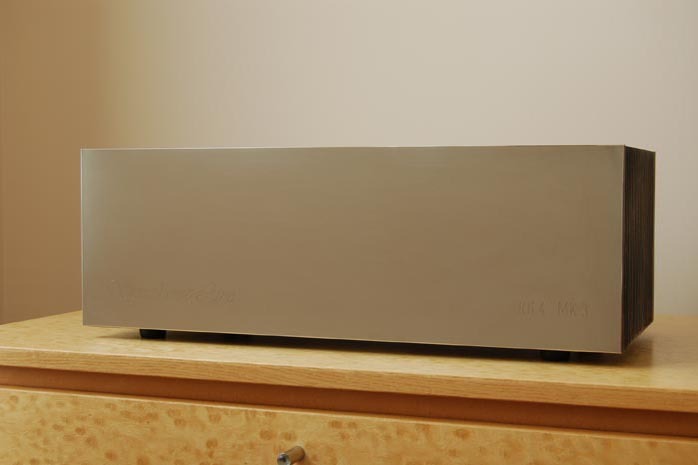 The MC-7P is a new preamp for Dared, with three line input plus MM phono and remote capabilities. The visually most striking feature have to be the four gold-plated copper valve capsules that house the 12AT7/12AX7 tubes. This preamp soon proved to be a perfect partner for my favorite Dared VP-20 6L6 monoblocks. Since I have two sets of VP-20s and the MC-7P is equipped with two sets of output sockets, bi-amping the Sapphire was the natural outcome. After listening through a variety of classical repertoire from instrumental solo to vocal and symphonic works, I had to conclude that I preferred the 6L6 more than the EL-34 (I always do). Bi-amping the Sapphire seemed to most noticeably energize piano playing but orchestral tutti definitely got better layering too. Jumping over to the other side of the fence, the NuForce P-9 + Reference 9 V2 combo was a totally different ball game. The rest of the audio chain remained unchanged. My digital source was still the Marantz SA6820 and cables included Clear Audio Silverline interconnects and OCOS speaker cables. Yet the NuForce carved out the entire sonic picture with laser precision. The immediacy and articulation of every musical note made me feel like sitting among the musicians. Is that musicality? Is that life-like? There's no definitive answer. 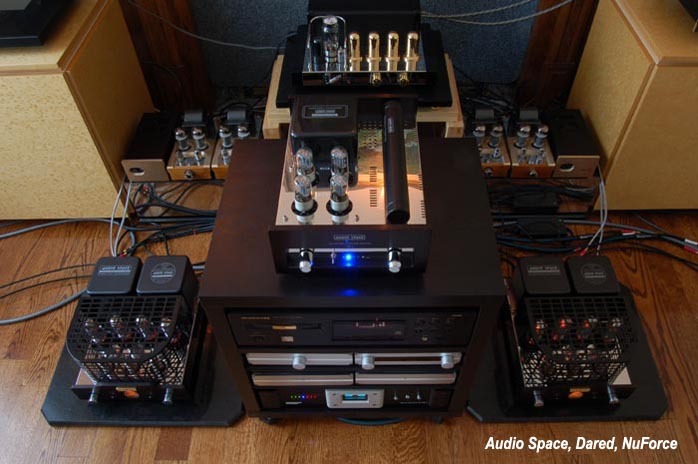 The technology behind any piece of audio equipment is science. But what it sets out to ultimately do is not science at all. Recreating a recording session or a live concert in a normal home is an art of illusion. Unlike cloning (which is science) but more like magic, audio is very much make believe. Two romantic piano trios passionately played by the Canadian Trio. The Arensky is a rarely recorded masterpiece with angelic melodies. Interpretation and sonic quality are comparable to the Borodin Trio's legendary performance on the Chandos label. Profoundly read and sensitively realized, Lewis' Beethoven complete cycle in the making is earnestly anticipated by the whole world for good reasons. His choice of tempo, his poetic freedom and his revitalizing approach true to the composer's intention make the old masters dull by comparison. The best piano recording you can find. Open-air concert recorded live at the historic Temple of Zeus, Athens, Mythodea is captivating and moving throughout the ten movements. Richly scored for huge orchestra and mixed choir, with a battalion of percussionists including 24 timpanists, it's not the ideal recording to assess imaging but a good tool to approximate open air ambience. Rarely known choral work by a composer who has always been close to our hearts. Deeply rooted in folk music that is rustic or patriotic at times. The most lively and harmoniously rich vocal performance. The best vocal recording ever and a true audiophile recording. Multi-channel SACD is awesome - I swear I am inside a church. Superb performance vividly captured, this world-class English duo warrants more attention. The viola sonata is Shostakovich's swan song. The last movement was skillfully crafted with the theme from Beethoven's Moonlight Sonata's first movement, intertwined with Shostakovich's own church bell leit motif from the Suite for Two Pianos, Op.6, which was written in remembrance of his father when the composer was only 15. The most popular choral work reconceived for brass and woodwinds. Stunning sonic effects with pinpoint imaging. The timbre is so organic that some of the passages are just like vocals! Last year, when my concert pianist friend Gloria Saarinen asked me to recommend an audio system for her, I invited her to audition one of my Dared systems partnered with the Loth-X BS-1 thinking that the warm tube sound should appeal to her. I was wrong. 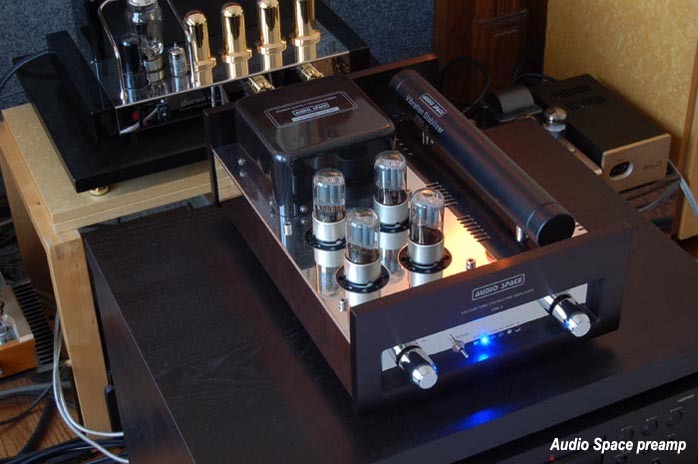 Tube amps, manifesto of musicality in most audiophiles' book, tends to conceal a lot of tonal shadings and harmonic subtleties - to a pianist's ears. Gloria didn't like that at all. She liked the Maximus Monitor with the Sim Audio Celeste W4070SE. Back to the Sapphire audition. Most of the time when I was laboring with my tube/solid-state switching, my wife Teresa had been quietly listening in the background. She's a much better pianist than I (at least she has her performer's diploma whereas I can hardly call myself a pianist since I never learned from a teacher). One day I tried to impress her with the magic of valve bloom. She frowned and said she liked what she heard yesterday. I was shocked. Sacrilege! How could she not like this warm mellow sound? Yesterday was D-day, NuForce and Audio Zone. Both were class D amps and as such scorned by tube advocates. I secretly checked my audition notes: "Very good detail of phrasing and pedaling. But the valve bloom magic is missing." The CDs I had been playing were Arensky Trio and Dvořák Trio [IBS 1010] played by The Canadian Trio in which our friend Gloria was the pianist; and Beethoven Sonatas Volume 2 [Harmonia Mundi HMC 901903.05] performed by Paul Lewis. Teresa urged me to put on whatever system I was using yesterday. I unplugged the Audio Space system from the Sapphires and plugged in the NuForce electronics. We listened through the entire "Waldstein" Sonata. "See," she got excited again, "now I can hear every detail in the finger work, the meticulous touch and the well-paced pedaling, even at pianissimo. I can feel what the pianist is feeling, almost like myself seated at the piano. Everything is clearly communicated. The tube amps paint a much bigger picture with broader brush strokes, almost like seeing things through a soft filter." These words should have come from me. I felt so shameful that they didn't. As a reviewer, I almost failed pathetically. As a nimble listener, I had lost my sensitivity and objectivity. What my wife said was so true and yet the art of illusion played tricks on my judgment. 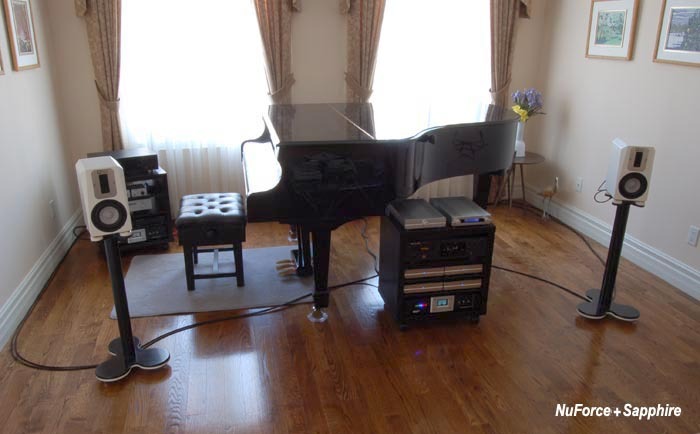 The NuForce and Mark & Daniel system gets you to the heart of music making. You feel like monitoring a recording session. What's wrong with that? Musicianship through ultra resolution just happens to be the motto of the other school of our illusionist's art as opposed to musicality through rich and mellow harmonics as propagated by the tube school. Both schools have their followers who claim what they hear is the real thing. The difference is, one wants to get closely involved and be well informed while the other one wants to sit back and relax to enjoy. Both schools have merit and there's no absolute winner. When playing back the Grieg Choral Music sung by Grex Vocalis under the direction of Carl Høgset [2L 45], the class D amps solicited crispy clear diction and rendered tiers of singers in three-dimensional layers. 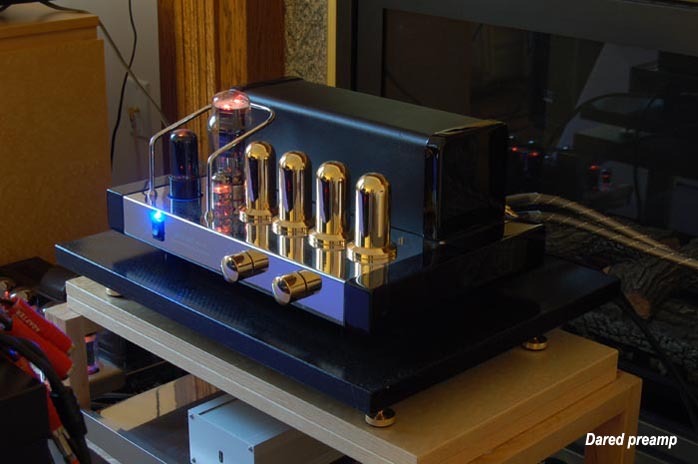 The tube amps polished everything into a honed façade of harmony. The difference was like standing on the podium versus sitting among the audience. You cannot argue which one is more musical. However, with ambitiously monstrous works like Vangelis' Mythodea [Sony SK89191] or the brassy majesty of Orff's Carmina Burana Suite arranged for band [Naxos 8.570242], I definitely prefer definition over warmth. 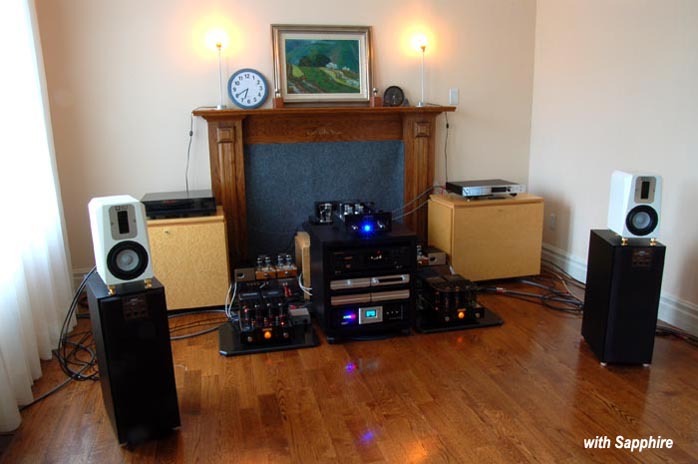 A few days later, I had the Sapphires hooked up to another preamp and power amp. I played the same piano CDs again, plus the Shostakovich Viola Sonata [Naxos 8.557231]. I admittedly picked a time when my wife was around and in fact was anxiously awaiting her comments. Before she spoke, I had already formulated my own comments, which I wrote down: "This is the best of both worlds. I have the heart-melting warmth and angelic, rich harmonics of the tubes. At the same time I also have the fast-reacting bass and precise control of solid-state." The gap was bridged. I was very confident and I was not going to let anyone dissuade me. As usual, my wife was enjoying the music and didn't say a word. I had to prompt her. "Is there any soft filter this time?" "No." "Can you hear the phrasing and the pedaling?" "Yes." 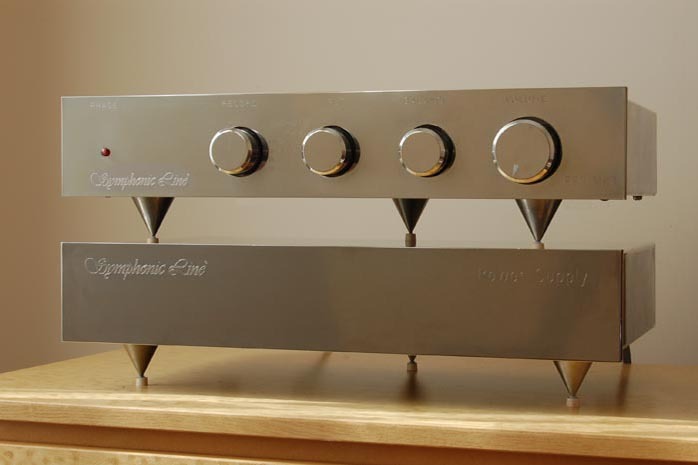 Ladies and gentlemen, the amps were the Symphonic Line RG3 Mk III preamp and RG4 Mk III monoblocks. Zero tubes! Mr. Rolf Gemein's pet project for years, the RG 3 and 4 are now in Mk IV version. The preamp has always been known for its tube-like behavior and the power amp, with its high-current resourcefulness at 150 wpc/8 ohm and stability down to 1 ohm, is the God-sent power plant for Mark & Daniel speakers.